If you pass Faneuil Hall and the Quincy Market, along the heavily trafficated Congress Street, take right at North Street, and the turn left. Here you find Union Street. 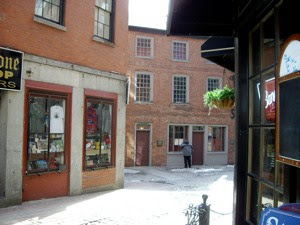 Between North Street and Hanover Street, you find a few small blocks, divided by Creek square, Blackstone street, Scott alley, and Marshall street. In these streets you find a few very interesting, old houses, and the oldest restaurant in North America, still in business. I have already told you about the Green Dragon Tavern and the Bell In Hand. In spite of their claim of old age, the original taverns were situated on another location. So let me tell you the stories of two other sights., the Ebenezer Hancock House and Ye Olde Union Oyster House.